1. COLORECTAL (COLON) CANCER: The second leading cancer killer in the U.S.
With timely screening (a test to look for disease before symptoms occur… precancerous polyps may be discovered and removed), it is preventable! Get screened if you are 50 years old or older, or earlier if you have a positive family history of colon cancer or inflammatory bowel disease. All women are at risk and risk increases with age. Of all the gynecologic cancers, only cervical cancer has a reliable screening test (i.e. the Pap test). 3. LUNG CANCER: The leading cause of cancer death in the U.S. There are screening tests for lung cancer (i.e. x-ray machine which scans the lungs), but these tests are controversial and debated. There is, however, no substitute for not smoking. For help quitting, call 1-800-QUIT NOW! Most men with prostate cancer are older than 65 years. As it is so slow-growing, most men do not die from the illness. Moreover, finding and treating prostate cancer before symptoms occur (ie testing the level of prostate specific antigen, PSA) may not improve your health or help you live longer. Ask your doctor if a PSA screen is indicated. 5. 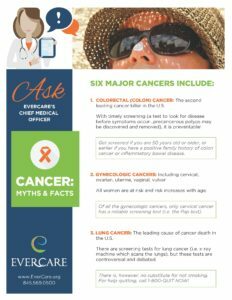 SKIN CANCER: The most common cancer in the U.S. Most cases of melanoma (deadliest form of skin cancer) are caused by exposure to ultraviolet (UV) light. Stay, midday, in the shade and wear protective clothing. Use SPF 15 or greater sunscreen. Screening for skin cancer involves regular total-body examinations by a skin doctor (dermatologist). Suspicious lesions are biopsied to determine if cancerous or precancerous cells are present. Getting regular mammograms can lower the risk of dying from breast cancer. Average-risk women age 50 to 74 years should receive a screening mammogram every two years. For women age 40 to 49 years, ask your doctor when to have a screening mammogram.